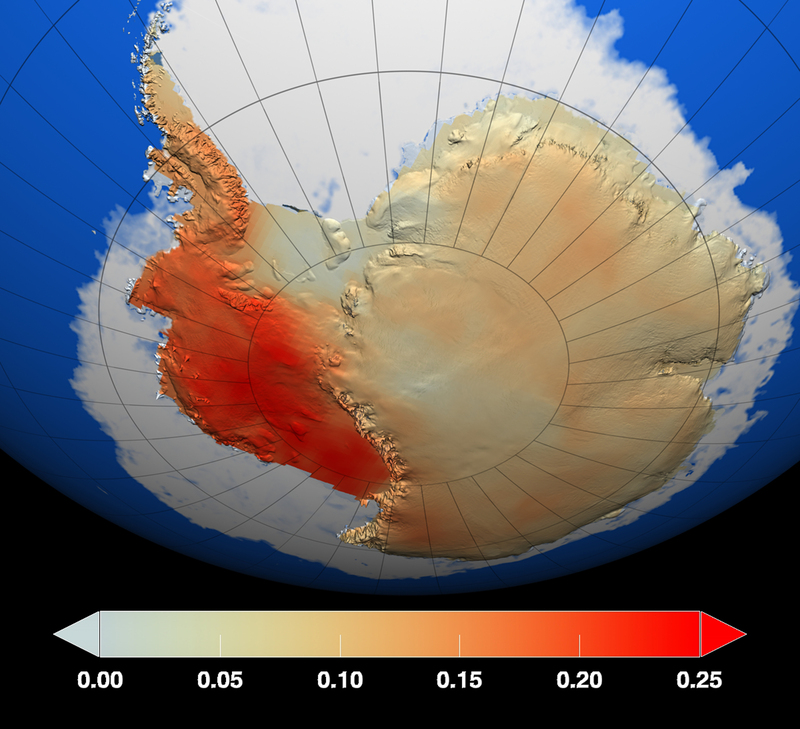 This Antarctic glacier may be history, says new research. It contains almost two feet of sea level rise, and that's just the beginning.<a href="http://www.nasa.gov/jpl/earth/antarctica-telecon20140512/#.U3ExeWSG25g">NASA</a>. If you truly understand global warming, then you know it’s all about the ice. That’s what matters. Planet Earth has not always had great ice sheets at the poles, of the sort that currently exist atop Greenland and Antarctica. In other periods, much of that water has instead been in liquid form, in the oceans—and the oceans have been much higher. How much? According to the National Academy of Sciences, the globe’s great ice sheets contain enough frozen water to raise sea levels worldwide by more than 60 meters. That’s about 200 feet. And it makes all the sea level rise that we’ve seen so far due to global warming appear piddly and insignificant. That’s why scientists have long feared a day like this would come. Two new scientific papers, in the journals Science and Geophysical Research Letters, report that major glaciers that are part of the West Antarctic Ice Sheet appear to have become irrevocably destabilized. The whole process may still play out on the scale of centuries, but due to the particular dynamics of this ice sheet, the collapse of these major glaciers now “appears unstoppable,” according to NASA (whose researchers are behind one of the two studies). The other group of researchers, based at the University of Washington, reach similar conclusions with their paper in Science. But they do so by using a computer model to study one of these glaciers in particular: The Thwaites Glacier, pictured above, which contains about two feet of sea level rise and is retreating rapidly. “The simulations indicate that early-stage collapse has begun,” notes their paper. What’s more, the Thwaites Glacier is a “linchpin” for the rest of the West Antarctic Ice Sheet; its rapid collapse would “probably spill over to adjacent catchments, undermining much of West Antarctica.” And considering that the entire West Antarctic Ice Sheet contains enough water to raise sea levels by 10 to 13 feet, that’s a really big deal. It is, again, important to emphasize that just because these glaciers may have passed the “point of no return” does not mean that dramatic sea level rise happens tomorrow. There is a limit to how fast glaciers and ice sheets can move, and the Science paper emphasizes that the entire process may take several hundred years and possibly as much as a millennium.